Announcing the Citizen's return to FRINGE. 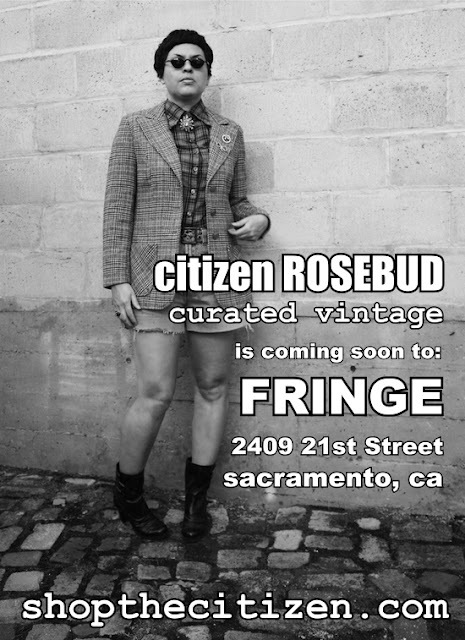 Thursday, October 6th marks the launch of citizen ROSEBUD curated vintage to the racks and shelves of Sacramento's most charming home, style + garden shop in Midtown. I will be posting a sampling of what's at FRINGE every week over at SHOPTHECITIZEN.COM, as well as once again amping up my online ETSY shop. Through out October, I'm going to offer ETSY customers FREE SHIPPING with the coupon code FREESHIP. So hop on over to the SHOP blog and see what we've got in store! You are amazing, Bella. Good wishes for all of your ventures! Sounds fabulous! Wish I were in the area. That's fantastic. I can't wait to see everything. You're a complete FOX in that photo! I'm so excited about your new ventures. I'll be following your Etsy shop to see all the goodies. :) I've still got that gift certificate! Wonderful! Best wishes to you -- I'd love to visit sometime. How fun!!! I'm so excited for you!!! :) I want to be in Sacramento. Sooo happy and sooo proud of you sweets!! !